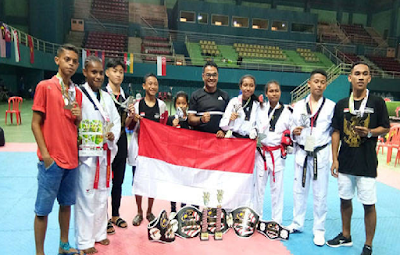 Reported from Pasificpos, The Papua Taekwondo Teaching and Training Team (PPLP) of Papua Province won the overall champion of the 2018 Taekwondo Championship Malaysia Open. The PPLP Papua Taekwondo Team won 5 gold medals, 2 silvers and 1 bronze. Five gold medals were achieved by Brando Taraudu, Mario Julius Sormudi, Charina Lasaole, Rebeca Marlinza Naa and Tanya Numberi. Silver medals were won by Javier Ethan Padangga and Veleria Djenar Wulandaru, while one bronze medal was donated by Maximianus Alun Wicaksono. PPLP Taekwondo Trainer Papua Fadriansyah Fachril said the results achieved by PPLP Taekwondo team were extraordinary. "We are the best of all participants, there are 16 countries with 1200 athletes," Fadriansyah said when confirmed on Monday (08/13/2018). Fadri added, Malaysia Open 2018 Taekwondo Championship as a test event for athletes to take part in the National Championship (National Championship) between PPLP / SKO throughout Indonesia in West Nusa Tenggara Province (NTB) in September. He said the PPLP Papua Taekwondo team would immediately return to Jayapura to conduct training camps. "We return to Jayapura and conduct training camps, before attending the National Championship in NTB," said Fadri. According to Fadri, during the training camp, his side will continue to hone the PPLP Papua Taekwondo team both mentally and technically in order to be ready to compete in the National Championship later. "The children are ready to compete in the National Championship, but they have to work harder to prepare, because there are definitely stronger opponents, so they must be serious about training and prepare themselves well," he said.